Fun for all ages, pogo sticks are not only good exercise but great entertainment as well. Small, fun toys for the kids or larger, modern sticks that can go as high as 10 feet, there is a pogo stick for everyone. To help you choose just the right pogo for you or a loved one, we have put together this pogo stick buying guide with all the tips and advice you need to get you hopping in no time. 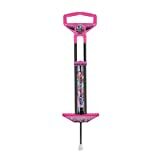 Kids Toy Pogo Sticks: Smaller in size and often made of foam, these pogo sticks are designed for smaller jumps so younger children can have all of the pogo fun, safely. Traditional Pogo Sticks: These pogo sticks have a pole, two footrests, and a spring for repeated bouncing. They are ideal for older children and adults as they come in a variety of sizes and weight restrictions. Professional Pogo Sticks: Built to withstand bigger weights with less impact on the jumper, professional pogo sticks are designed with extreme athletes in mind. 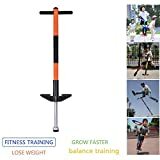 With top brands offering unique springless technologies, professional pogo sticks will take your jumping hobby to the extreme. Size: Reviewers comment that pogo sticks that allow for all their children (and parents, too) to enjoy the fun of pogo jumping are good purchases. Matching your prospective pogo stick to the ages and skill of the jumpers will ensure satisfaction. Safety: Safety is a big concern for pogo stick buyers, especially parents. Quality pogo sticks that suite the weight of the user will ensure that they are safe and don’t fly all over the place. Value for Money: When it comes to beginners and children’s pogo sticks, owners rate sticks higher when they offer more value for money. 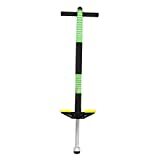 Pogo sticks that are durable and cost effective are real crowd pleasers. Professional Sticks: For those online reviewers into extreme pogoing, professional pogo sticks rate higher. 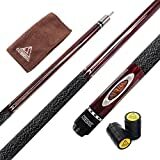 If you are willing to spend more for more stability and height, professional sticks are rated well above any other sticks when it comes to sporting needs. Choosing a size: What is the age and skill level of the jumper? Do you want something your kids can grow into or something the whole family can use? For very young kids, opt for the foam toys, and for older kids buy one they can use and still grow into for years of fun. For adults, buy larger professional pogo sticks designed for pogo sporting. 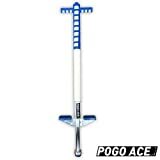 Check the weight restrictions and guidelines of a pogo stick before purchasing to make sure it is safe for the intended jumper to us. If the jumper is too heavy for the pogo stick, it could buckle and cause injury. Too light, the jumper could be sprung too high and fall. To make sure your pogo stick is durable, opt for a reputable name brand that is reviewed well for quality. Extreme Pogo or Xpogo is the sport of pogo sticking, which includes tricks and height challenges. 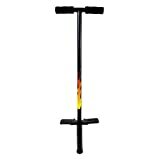 For adventurers interested in pursuing this hobby for fun or exercise, professional pogo sticks are the way to go. 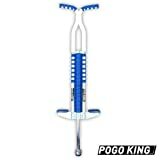 For professionals who want the smoothest low impact jump, opt for a spring-free professional pogo stick. Kidoozie: Kidoozie is a leading brand of International Playthings, LLC. Formed in 1967, International Playthings, LLC has aimed to provide innovative, entertaining, quality pogo sticks and other products for children. Geospace: With over 20 years of experience, Geospace manufactures and distributes unique fun toys to kids and is a top rated pogo stick brand. 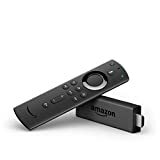 FlyBar: One of the original pogo stick manufacturers, Fly Bar has sold over 25 million pogo sticks worldwide and is considered a pogo stick expert by consumers. Razor: Specialising in outdoor riding, jumping, and extreme sporting equipment, Razor has grown into one of the leading pogo stick manufacturers since forming in 2000.